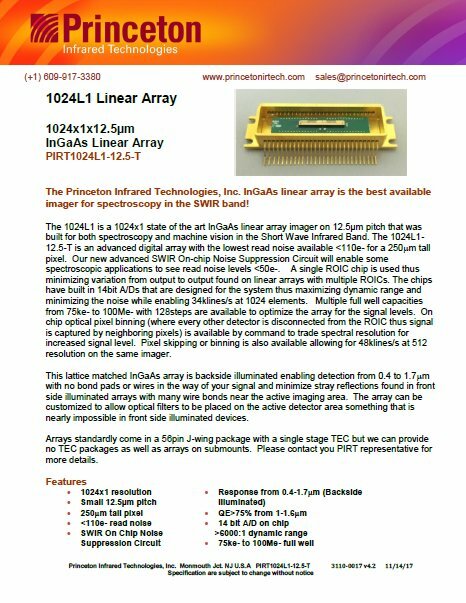 The 1024L1 is a 1024x1 state of the art InGaAs linear array imager on 12.5µm pitch that was built for both spectroscopy and machine vision in the Short Wave Infrared Band. The 1024L1-12.5-T is an advanced digital array with the lowest read noise available <110e- for a 250μm tall pixel. Our new advanced SWIR On-chip Noise Suppression Circuit will enable some spectroscopic applications to see read noise levels <80e-. A single ROIC chip is used thus minimizing variation from output to output found on linear arrays with multiple ROICs. The chips have built in 14bit A/Ds that are designed for the system thus maximizing dynamic range and minimizing the noise while enabling 34klines/s at 1024 elements. 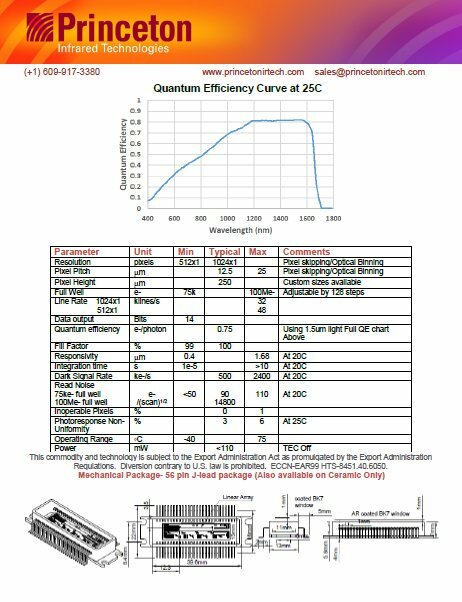 Multiple full well capacities from 75ke- to 100Me- with 128steps are available to optimize the array for the signal levels. On chip optical pixel binning (where every other detector is disconnected from the ROIC thus signal is captured by neighboring pixels) is available by command to trade spectral resolution for increased signal level. Pixel skipping or binning is also available allowing for 48klines/s at 512 resolution on the same imager. This lattice matched InGaAs array is backside illuminated enabling detection from 0.4 to 1.7μm with no bond pads or wires in the way of your signal and minimize stray reflections found in front side illuminated arrays with many wire bonds near the active imaging area. The array can be customized to allow optical filters to be placed on the active detector area something that is nearly impossible in front side illuminated devices. Arrays standardly come in a 56pin J-wing package with a single stage TEC but we can provide no TEC packages as well as arrays on submounts. Please contact you PIRT representative for more details. These commodities, technology are subject to the Export Administration Act as declared by the Export Administration Regulations. Diversion contrary to U.S. law is prohibited.